I think this restaurant has probably got the most beautiful views in Albufeira! My husband and I discovered it by accident during our first visit to Portugal, last year. It has tables that look out over the wide sandy beach and across the sea. It is truly beautiful. What a find! The restaurant staff are very courteous and helpful. They speak excellent English and never rush us. 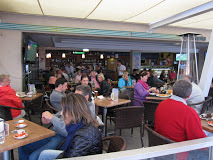 We make a point of visiting here whenever we are in Albufeira. The toilets are spotless too! We stop here partly for the view but also because the food is delicious. They do an offer of coffee and cake for only 3.50 euros. Frankly sitting enjoying the view is worth that alone. I can highly recommend Esplanada do tunel. We will certainly be back. My husband and I only discovered Portugal last year. I mean, we knew it existed, but neither of us had ever ventured to visit the country previously. However, our friends Pauleen and David have gone every year for many years and commended the Algarve to us. They like to walk. They go serious walking with proper boots and sticks. We choose to opt for a much less physical vacation. Nevertheless, the area suits us all well and we are indebted to them for their introduction to this beautiful part of the world. 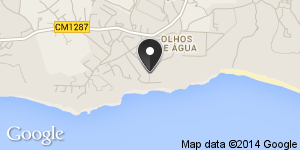 The village we choose to stay in is Olhos de Agua. 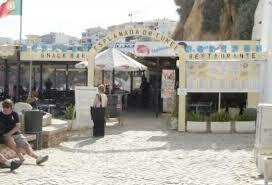 It is about 5 kilometers East of Albufeira. We like the village because it is quiet but has some interesting shops, the people are lovely and there are some delightful little restaurants and cafes within easy walking distance of our hotel: no boots or walking sticks required! One of our favourite haunts is the charming little restaurant, Acqua Gelataria Pizzeria, near the beach. The staff are really nice, but not intrusive. We are never rushed, even if we just stop in for a coffee while we sit and watch the world go by. The food is always tasty and fresh and the cakes are delicious. In addition to all of this the prices are surprisingly reasonable. We seek out an excuse to visit. Acqua has large screen televisions that usually have the current sporting event running: be this a Grand Prix, Football match or marathon. My husband likes to keep an eye on these and many people stop in to watch the events. However, the sound is always kept down so that those of us who are less interested do not find them an irritation. We plan to visit this resort again and will definitely include Acqua Gelataria Pizzeria amongst the places we stop at then. I highly recommend this dependable and friendly little restaurant.